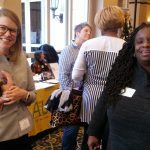 We were joined by over 800 women at the Virginia Women’s Conference held at Roanoke Hotel and Conference Center, November 17, 2018. 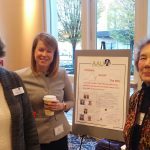 It was wonderful to have many of these women stop by the table that was sponsored by AAUW of Virginia so that we could share information on AAUW. 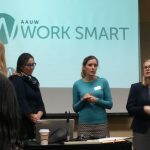 It was very exciting that during the conference, two StartSmart workshops were led by AAUW National’s Dorrie Sieburg, AAUW Start Smart Program Manager, and Sarah Spencer, AAUW Program Associate. 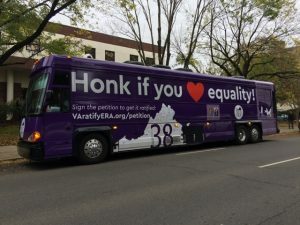 Many thanks for the support of AAUW National’s Anne Hedgepeth, AAUW Director of Federal Policy, for joining Carol Stephens (AAUW VA Co-President), Sylvia Rogers (AAUW VA Co- VP for Public Policy), Cyndi Shanahan (AAUW VA VP for Membership) and members of the Roanoke branch at the AAUW table. We were then thrilled when the Virginia Ratify ERA bus showed up at about 2 PM so that it could be shared with all the attendees of the conference. Dorrie Sieburg and Sarah Spencer at the workshop. This entry was posted in General on November 26, 2018 by pnquick.